The final position of AlphaGo’s third win in a five-game match Lee Sedol, the top Go professional. But what does that mean for human competition? Screenshot by kenming_wang on Flickr. A selection of 15 links for you. Use them wisely. I’m charlesarthur on Twitter. Observations and links welcome. »wireshark revealed that [the data protocol] was Modbus over TCP. Modbus is a pretty trivial protocol, and notably has no authentication whatsoever. tcpdump showed that traffic was being sent to 172.16.207.14, and pymodbus let me start controlling my lights, turning the TV on and off and even making my curtains open and close. What fun! And then I noticed something. My room number is 714. The IP address I was communicating with was 172.16.207.14. They wouldn’t, would they? It’s basically as bad as it could be – once I’d figured out the gateway, I could access the control systems on every floor and query other rooms to figure out whether the lights were on or not, which strongly implies that I could control them as well. Jesus Molina talked about doing this kind of thing a couple of years ago, so it’s not some kind of one-off – instead, hotels are happily deploying systems with no meaningful security, and the outcome of sending a constant stream of “Set room lights to full” and “Open curtain” commands at 3AM seems fairly predictable. »Intensive research around the world has focused on improving the performance of solar photovoltaic cells and bringing down their cost. But very little attention has been paid to the best ways of arranging those cells, which are typically placed flat on a rooftop or other surface, or sometimes attached to motorized structures that keep the cells pointed toward the sun as it crosses the sky. They’re not pretty, but they are efficient. Bloody cold (snow all over the ground) and they must have been shooting the video for at least five hours, judging by the clocks you can see at various points. This is shorter than that. The first use of the polyphonic synthesiser (able to play more than one note at a time) in a rock song. Farewell, Keith Emerson. »OK. Go ahead and turn up the volume because this update is for you, Alexa. Last week, we talked about Alexa, the voice-activated assistant that operates on a speaker sold by Amazon called the Echo. The technology is Amazon’s way of connecting to your home as part of a future where you walk into your house and you say – out loud – turn off the alarm. Dim the lights. Preheat the oven. Well, some of you out there already own an Amazon Echo, and our story activated your Alexas. I guess her ears were burning. Listener Roy Hagar wrote in to say our story prompted his Alexa to reset his thermostat to 70 degrees. It was difficult for Jeff Finan to hear the story because his radio was right next to his Echo speaker, and when Alex heard her name, she started playing an NPR News summary. Marc-Paul Lee said his unit started going crazy too and wrote in to tell us this – let’s just say we both enjoyed the story. So Alexa, listen up – we want you to pledge to your local member station. You hear me? Lots and lots of money. Did you get that, Alexa? »Xiaomi owns 30% of Xunlei and has incorporated its acceleration technology into its ecosystem from MIUI6 (2014) going forward. As a result of this, the performance of Xunlei’s advertising revenues gives some indication of how usage is faring within Xiaomi’s ecosystem and the numbers are not encouraging. Xunlei’s Q4 2015A revenues declined 1.1% to US$35m however within that online advertising revenues were $1.7m growing 24% YoY with mobile advertising making a contribution for the first time. …if all Xiaomi is doing is providing nicely specified devices at rock bottom prices then it is in fact helping its competitors rather than itself. This is exactly the same problem that other Android handset makers have outside of China. These handset makers slash each other’s throats to put better and better devices in the hands of users but it is Google that reaps all of the benefit from the subsequent usage increases. »Yahoo today announced its Q1 2016 progress report, highlighting the closure of several products and regional sites. As shared in its last earnings call, the company wants to focus on just seven core consumer products: Mail, Search, Tumblr, News, Sports, Finance, and Lifestyle. It’s also closing Yahoo Astrology in the UK, France, Germany, Spain and India. I’m sure they saw it coming though. As for Yahoo, its fate seems to be to pare off more and more of its sites until there’s just a nameplate on an office somewhere in Delaware. »At least 30 transfer requests were made on 5 February using the Bangladesh Bank’s SWIFT code, out of which five resulted in successful transfers, AP reports, citing Bangladeshi newspaper reports. If all the transfers were effected thieves would have made off with $950m. However, a spelling mistake in the name of one recipient led Deutsche Bank, which was involved in routing funds, to raise a query. The Federal Reserve Bank of New York flagged up the unusual transfer of funds to private accounts to the Bangladesh central bank at around the same time. “Four requests to transfer a total of about $81m to the Philippines went through, but a fifth, for $20m, to a Sri Lankan non-profit organisation, was held up because the hackers misspelled the name of the NGO, Shalika Foundation,” Reuters reports. The crooks misspelled “foundation” in the NGO’s name as “fandation”, prompting the query from Deutsche Bank. »You’re a great negotiator at home, but how would you fare on the world stage? Strong negotiating skills in one culture can actually be a disadvantage in another, according to Erin Meyer, author of Getting to Si, Ja, Oui, Hai and Da. Also needs “what do phrases actually mean?” – given that when a Briton says “really?” they usually mean “that’s the stupidest thing I’ve ever heard”. »I hate hearing it as much as I hate writing it. It’s far easier to simply blame platform owners for failing to pull levers and influence economies; for treating Facebook or HBO better than they treat the 76th Notes app to launch this year. If the absolutely capricious and often maddening [Apple App STore] review process and lack of attention really did chill innovation, though, it should be easy to point to Google Play and its over half-a-decade of relatively lax approval policies, and see year after year of ground-breaking, platform-making, device-selling apps that would never come to market on the App Store. That would be the fastest way to get Apple to change review policies — force them to scramble into recovery mode, show the company rather than tell. But there’s nothing to show. Google Play isn’t full of universe-denting mobile software that iPhone and iPad owners simply can’t get. It has a few things like custom launchers, but those remain incredibly niche. All the truly important apps of the last few years, from Instagram to Uber, all work just fine on the iPhone. In fact, they often work sooner and better. If Apple did provide for trials and upgrade pricing and allowed more direct customer relationships, it’s uncertain how much that would really change things either. We live in an age of venture capital and mega corporations who can easily afford to release high-quality apps frequently and for free. It is an unbeatable riposte to “trials would make all the difference” to say “well, it hasn’t for developers on Android”. Now read on..
»Last month, Apple announced it had paid $40 billion to developers since the App Store opened, saying the store was responsible for “creating and supporting” 1.9 million US jobs. More than half a million iOS developers have created apps; the company’s Worldwide Developer Conference is so popular that tickets have to be distributed via a lottery. “[Apple] made our company,” Sykora says. “If Apple didn’t exist, we wouldn’t have a company at all.” And the market for apps is growing: between iOS, Android, and smaller platforms, apps could generate $101 billion annually by 2020, according to market research firm App Annie. For a time, Pixite was a shining example of the businesses made possible by the app economy. Like thousands of other developers, Pixite’s founders took what had been a side project and turned it into a full-fledged career. But the company’s recent financial problems illustrate a series of powerful shifts in the industry toward consolidation and corporatization. The death of the middle class here reflects wider changes in the outside world – but with evolution speeded up thousands of times. In passing, this article by Newton, and the interview below by Sam Byford, are two excellent pieces of journalism: as long as they need to be, well-researched, intimate, illuminating. »A computer program has beaten a master Go player 3-0 in a best-of-five competition, in what is seen as a landmark moment for artificial intelligence. Google’s AlphaGo program was playing against Lee Se-dol in Seoul, in South Korea. Mr Lee had been confident he would win before the competition started. The Chinese board game is considered to be a much more complex challenge for a computer than chess. “AlphaGo played consistently from beginning to the end while Lee, as he is only human, showed some mental vulnerability,” one of Lee’s former coaches, Kwon Kap-Yong, told the AFP news agency. This is what people overlooked in thinking that Se-dol would be able to pull things back even if he lost the first game. There’s no emotion in the machine; it just slogs on (and like chess, Go gets easier to compute towards the end). The human feels the pressure of being behind, and the pressure to win. The machine won’t blunder. The human can. I’m certain it will be a 5-0 result. »SB: So let’s move onto smartphone assistants. I saw you put up a slide from Her in your presentation on the opening day — is that really the endgame here? DH: No, I mean Her is just an easy popular mainstream view of what that sort of thing is. I just think we would like these smartphone assistant things to actually be smart and contextual and have a deeper understanding of what you’re trying to do. At the moment most of these systems are extremely brittle — once you go off the templates that have been pre-programmed then they’re pretty useless. So it’s about making that actually adaptable and flexible and more robust. SB: What’s the breakthrough that’s needed to improve these? Why couldn’t we work on it tomorrow? DH: Well, we can — I just think you need a different approach. Again, it’s this dichotomy between pre-programmed and learnt. At the moment pretty much all smartphone assistants are special-cased and pre-programmed and that means they’re brittle because they can only do the things they were pre-programmed for. And the real world’s very messy and complicated and users do all sorts of unpredictable things that you can’t know ahead of time. Our belief at DeepMind, certainly this was the founding principle, is that the only way to do intelligence is to do learning from the ground up and be general. »Imagine organizing a “Turing tournament” where all the subjects were human, but an interrogator was told that half of the subjects were machines. Tasked to determine which subjects were human and which were machine, the interrogator would be forced to choose which subject was “more human.” As a result, it is therefore possible to measure “how human” each human is. Or at least: how well each human performs human intelligence. The next natural step is that there’s no reason to believe that computer programs can’t “out-human” us, achieving Elo ratings in the imitation game much higher than any human. This observation is particularly true if the interrogator in the game is human; the natural next step would be to put in place a machine interrogator, who would probably be able to discern the difference between subjects better than any human. As a first step in this direction, research on CAPTCHAs targets precisely this task of discriminating between machines and humans. But beyond CAPTCHAs, at what point can a machine no longer tell the difference between a human and a machine? I know from first-hand experience that people want this data, and want to put it to use, and as I explained to LACMA in 2014, they will get it, one way or another. When museums refuse to provide it, the public is left in the dark and is open to having bogus or uncertain data foisted upon it. Museums should not be repositories of secret knowledge, but unfortunately, as I’ve noted elsewhere, Neues is not alone in keeping their scan data to themselves. There are many influential museums, universities, and private collections that have extremely high quality 3D data of important works, but they are not sharing that data with the public. He lists dozens of high-quality scans that are being hoarded by museums, from famous Rodin and Michelangelo sculptures, to Assyrian reliefs that are thousands of years old. If the artists behind The Other Nefertiti would come clean about where their scan came from, they might inspire other artists to force museums to open up their archives and allow many other artworks to return home— or come into our homes, making art part of our everyday lives. There’s the scent of a novel in this. Which is real, the scan or the “original”? »Uber customers are warning others to be wary of using the ride-hailing app after they say they were charged hundreds in vehicle cleaning fees for messes they claim they never made. Jordan Hunter, a 22-year-old senior at University of Texas, says she and a group of friends were left stunned after a six-mile Uber ride in Austin left them with a triple-digit bill for what Uber said were cleaning purposes. The group of six friends took an Uber home early on Saturday, Feb. 7, Hunter told BuzzFeed News. The friends were irritated by the surge pricing, but were willing to cough up the $68 it would cost to get home safely. After arriving home, the friends were shocked to see they had been charged an additional $100 for a cleaning fee. Sounds like drivers figuring out a way to make some extra cash on the side. If there’s a wrinkle, people will find it. This entry was posted in links and tagged 3dprinting, ai, alphago, android, apps, hacking, security, uber, xiaomi, yahoo by charlesarthur. Bookmark the permalink. Indeed, I’m not a gambler. Probably just as well. 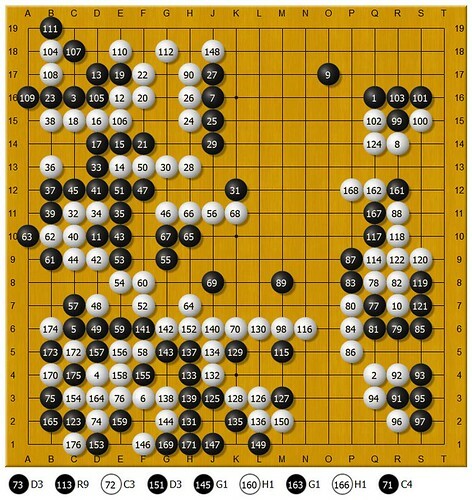 But Sedol seems to be learning from AlphaGo, which bolsters the idea in the article. Absolutely. I guess its moot to argue whether Lee is learning from AlphaGo or adapting to his opponent – as he would do whether human or AI. Either way, in the end, AI will likely reign supreme in any game which basically comes down to permutations.